As the Rev. 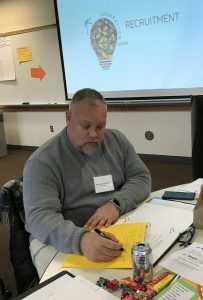 Jonathan Elgersma, senior pastor at Faith Reformed Church in Zeeland, Michigan, ambitiously scribbled note upon note in his jam-packed director’s manual, other pastors at his roundtable spouted idea after idea. The problem they were debating, and seeking to solve, concerns them deeply, so their discussions toward implementing a possible solution were focused and lively. The possible solution? Generation Spark, a newly-created program by Hope College’s Center for Leadership (CFL) funded through a $458,502 grant given by Lilly Endowment Inc. in 2017. 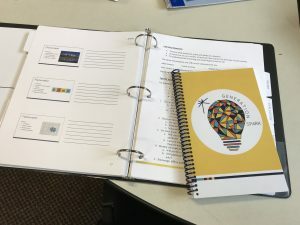 The new program’s research-based action plan is to retain youth (ages 16-24) and adults (ages 45 and older) and fully integrate them into the life and leadership of the church in ways that are intergenerational, relational and entrepreneurial. Representatives from five other area churches who feel the same way joined Elgersma for the first day-long Generation Spark training program on Hope’s campus. Other church leaders present were Beckwith Hills Christian Reformed Church of Grand Rapids; First Reformed Church of Holland; Hope Church of Holland; Parkside Bible Church of Holland; and VictoryPoint Ministries of Holland. Hope students working with CFL — senior Allison DeVries, senior Kaelyn Tarsa, junior Monica Ruser and sophomore Matthew VanDyken — led the training along with consultant Kathy Stanek and Generation Spark program director Virgil Gulker, who is also servant-leader in residence with CFL and a lecturer in business and economics at Hope. 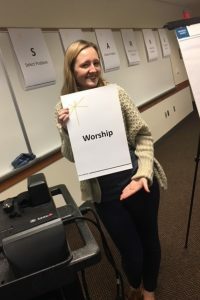 Since youth want and need a platform to speak and be heard, Generation Spark’s strategy works this way: Younger church members are connected with older members in mentoring relationships, supported by prayer partners. 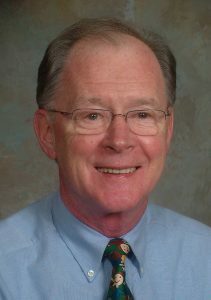 Then, in one-on-one meetings over 12 weeks, they are given one unique aim: to identify, assess and recommend solutions for a real problem affecting the church and its community. Allison DeVries presents at Generation Spark training. 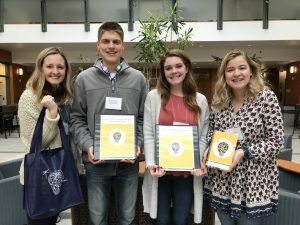 “An adult and a youth come together to solve a problem they identify as being an issue, such as bullying within the youth’s middle school class,” explains DeVries, a business major, who was charged with the planning and implementation of training for the first Generation Spark churches. “The mentor-mentee work together to discuss a way to solve that problem. Then they are encouraged to go in front of their churches after the 12 weeks to explain the process they went through and also to appeal to the church for their involvement with the solution together. “They’re not just sharing coffee, they’re sharing a purpose,” Gulker adds. DeVries felt the same sense of purpose, too, in her work for CFL on behalf of Generation Spark. Her desire to become involved was both personal and professional. Hope students directly involved in the planning and implementation of Generation Spark include, left to right, Allison DeVries, Matthew VanDyken, Monica Ruser, and Kaelyn Tarsa. VanDyken, also a business major, is working to hone the existing marketing materials for future church collaboration and participation. More Hope students will join in the Generation Spark effort over the next couple years. The Lilly Endowment Inc. grant supports the program’s invention and fine-tuning over a three-year period. By the end of the pilot, CFL plans to develop a model that individual congregations can implement on their own. “While some of the social issues that Generation Spark mentors and mentees tackle — like hunger in schools or underage drinking — may never go away, I hope we see them diminish because of Generation Spark’s impact,” says DeVries. And as some social problems possibly diminish, youth in the church possibly increases. That is the hopeful intent of Generation Spark. Next Next post: Working and Thriving in Washington, D.C.